“They’re just as good if you inflate them enough,” my boyfriend Tom insisted, jamming his knee up and down, bringing our kayak closer to life with every thrust of the foot pump. Enticed to Menorca by a wave of adverts hailing the island as a ‘paradise for paddlers’, Tom had rejected my suggestion to hire a ‘real’ kayak, (the sturdy, fibre-glass type) insisting we squash a week’s worth of clothes into one bag and bring our blow-up boat in place of a second suitcase. Kayak inflated, we threw in the essentials for a full day at sea: wine, fishing rod and a picnic of fresh bread, local cheese and Menorcan sobrasada – chorizo-like sausage meat. Setting-off from the waterside capital of Mahon, we drifted into the calm waters of the world’s second biggest natural harbour. The plan was to paddle for a couple of hours to the cove of Cala Alcaufar for lunch, then continue west along the island’s smooth southern shoreline to Son Bou – Menorca’s longest beach. “This is easy,” boasted Tom, casting a line of glinting fish hooks into the water while I propelled us along with effortless paddling. We cruised past an 18th century British Naval Hospital on King Island, giving the yachts that ply these busy waters a wide berth as they motored by. Above our heads, the smart villas of Menorca’s elite studded the cliff-tops and down at sea-level, oily feathered shags stood watch over teeming rock pools. With the Mediterranean Sea in sight, a breeze agitated my hair, the water began to dance and the nose of our kayak bounced playfully in the chop. Avoiding the rocks where clusters of muscles waited like razors, we steered towards the harbour mouth until a strong pull sucked us out to sea. Once in open water, someone switched on the wave-machine. Rollers, breakers, white horses and roaring surf came at us from every direction, tossing us about like a toy boat. Salt water splashed over the bow, surged over the stern and the horizon bounced around like the attitude indicator on a fighter plane. Seasickness soon arrived on the scene and Tom started retching over the side. The killer blow came from a side-on wave that had us clutching at the paddle holders like petrified children while water inundated the boat. “The picnic!” Tom gasped, as our lunch abandoned ship. “My sandal!” I shrieked, seeing the left foot sail away like a tiny life-boat. Then I saw it: an inlet of snaking sheltered water beckoned just ahead. Paddling furiously towards our escape route, we missioned away from the Med until the swell and our sickness subsided. When it was calm enough to balance our paddles across our laps, we collapsed on our backs like wounded soldiers – two dead bodies lolling on a drifting waterbed. I was jolted awake ten minutes later when Tom dived overboard. Before I could panic, he burst to the surface holding two clenched fists above his head. “Which colour?” he asked, bobbing up and down as if on a running machine, and unfurled his palms to reveal two tiny sea urchins – one moss-green the other a deep lavender. A narrow channel, sheltered from the sea, rocky banks draped in greenery rose around us and emerald-tinged waters bathed our boat. We weaved along the watercourse, listening to the plop of leaping fish, their silver bodies twinkling in the sun like jewels. We tied our kayak to a tree and scrambled ashore, heaving ourselves up on roots that dangled over the banks like ropes. We’d completed a fraction of our intended voyage but, between us, deemed it too dangerous to continue by kayak. Instead, we resumed our exploration on foot and clambered through the foliage to find a rugged pathway that broke away from the inlet: we had stumbled across the Cami de Cavalls – an ancient bridleway which circumnavigates the island. Once used by messengers to carry news of attack, the trail had recently been restored as a waymarked route, open to horses, bikes and hikers. I walked barefoot, red dust collecting between my toes as I padded across the hot ground. Where the track traced through scrubland, the smell of wild olives and rosemary filled our nostrils and, as we entered shaded woodlands, I trod carefully where pine-needles carpeted the path. An hour later, to our surprise, we arrived in Cala Alcaufar. Toasting our successful escape-mission from the claws of the Med, we tucked into fresh sardines at a restaurant right on the beach. Children splashed and screeched in the shallows, ramblers and cyclists continued across the cliff-tops along the Cami de Cavalls and two kayakers casually paddled into shore before pulling their fibre-glass boats onto the beach. “It’s easier in a ‘real’ kayak,” Tom mumbled, barely looking up from his lunch. Travel article by Brighton copywriter and Journalist, Lucy Grewcock. When I visited Cape Town as a penniless backpacker in 2001, I turned my nose up at the V and A Waterfront. It seemed far too touristy and commercialised for my liking back then - where was the grit and grime I'd traveled to South Africa to see? But on returning twelve years later with my boyfriend Tom, I've been pleasantly surprised. Yes, it's commercial; yes, it's a world away from the townships; yes, it has air-conditioned malls and international chain shops; and yes, it's a honeypot for tourists. But what they've done with the waterfront is fantastic and, like other redeveloped docks around the worldwide, it's a slice of city life that's pretty nice to soak up for a few hours. One of the best things about the Western Cape is the food: fruit is more flavoursome, meats more tender, seafood fresher, coffee richer and veggies crisper. Wherever you dine, your stomach will thank you for visiting South Africa, and for pure choice and variety, the V and A Waterfront isn't a bad place to start. We I started at Vovo Telo, taking a seat in the sun at this artisan bakery. After watching iced buns, fist thick lamb burgers and foot-long focaccia wedges arrive at people's tables, we ordered a succulent steak sandwich to share along with freshly ground coffee and just-squeezed satsuma juice. Next stop was the new-ish indoor food market next to Nobel Laureate Square. Housed inside a historic power station, this foodie heaven was opened in 2011 and aims to be on a par with the likes of London's Borough Market. Tom and I tasted our way through tidbits of ostrich biltong (cured meat), olive jam, wheat grass smoothies, hot cross bun ice-cream (it's Easter), dim sum and an assortment of spicy African sauces, before buy a splodge of frozen yoghurt finished with passion fruit slime and plump raspberries. For fresh fish with harbour views, the Harbour House is hard to beat. After an uncouth starter of oysters on ice, salmon sashimi and steaming mussels - we ordered all our favourite starters, just because 'we could' - I tucked into pale Cape Salmon while Tom devoured chunks of rare tuna almost two inches thick. What else is at the Waterfront? 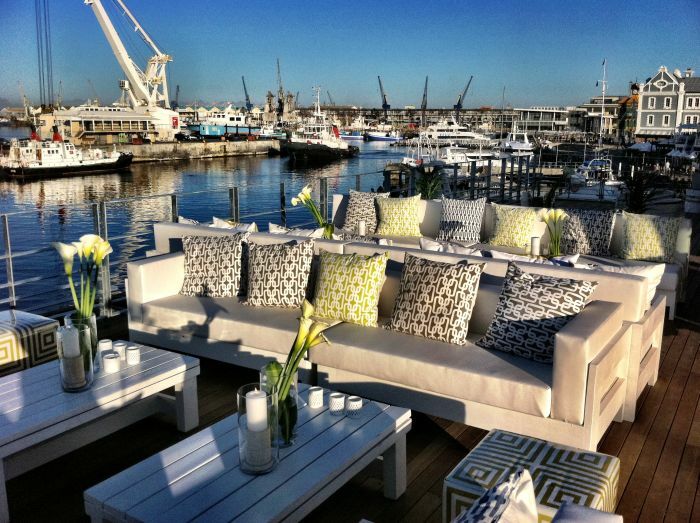 Boat trips galore: It's long been the point of embarkation for trips out to Robben Island but the Waterfront is also the place to hop on a harbour tour, go jet-boating, set sail on the Jolly Roger, take a sunset cruise with champagne or go wildlife watching. Simply stroll along the harbour-side and hop on. Non-stop shopping: Expect everything from Rip-Curl and Zara stores, to indigenous art and local crafts. There are more than 450 shops spread across the indoor site - mainly in the multi-story indoor mall. Personally, shopping like this isn't how I'd choose to spend my time here, but if there's something you need to buy while you're here, I'd be amazed if you couldn't get hold of it at the harbour. Tourist attractions: There's a diamond museum and a diving centre, a playground and a pirate boat, an aquiraium and adrenaline sports, bicycle rental and a big wheel, history and helicopter rides, seal watching and a cinema. For ready made rainy day attractions and family fun, there's certainly lots to choose from if you're not the sort to venture city-wide. What's more it's still a working harbour and there's plenty here for history-buffs. Having taken an evening flight from London to Amsterdam on Good Friday, my boyfriend Tom and I spent the night in the Ibis Amsterdam Airport hotel, waking to snowflakes the following morning. Twelve hours, three in-flight meals and several films later we touched down in Cape Town, picked up our hire car and made our way to Atlantic Point Backpackers. It's more than ten years since I was last in Cape Town, having stopped here back in 2001 on a post A-levels trip around the world. Returning now with a few more rand in my money-belt, I had decided to swap a city centre dorm room for a double room near the waterfront, but was still taken by surprise at the stylish decor and slick interiors at our hostel. Designer wallpaper, handcrafted picture frames, a swish new kitchen and a mini putting green outside by the pool: is this the norm for backpackers in Cape Town these days? I certainly wasn't complaining. Excuse the mess - focus on the funky frames & wallpaper instead! Located a few minutes' stroll from Cape Town Stadium, at Green Point (built in 2010 for the FIFA World Cup), arriving at Atlantic Point from the airport was fairly easy. Having read several scare stories and warnings not to drive in Cape Town at night, we'd been reassured by friends that we'd be fine, so long as we stuck to the main roads and central areas. While Cape Town's reputation for crime and danger shouldn't be shrugged off, neither should you come here expecting every other person to pull out a gun. Being aware of your belongings, sticking to street-lit areas at night, and taking taxis when you have no idea where you're going are safety precautions you should probably take in any big city and, with the crime rate in Cape Town, it's wise to take all this a little more seriously. But speak to the people who live here and you'll realise that not everyone who lives in a township wants to mug you and that the locals don't live in constant fear for their lives. Cape town is packed with happy, friendly and super smiley people who are ready to share their city but if you plan on staggering around drunk at night, flashing your iPad about and carrying a wallet that bulges with cash, you'll be rich pickings for other backpackers, let alone the locals. Since my last round-up, back in May 2012, I haven't been anywhere as far-flung as Antarctica. Instead I've been exploring the UK in greater detail and appreciating the fantastic travel opportunities right on my doorstep. Scilly Isles: Taking the train from Paddington to Penzance, I hopped on the Scilly Isles' ferry and journeyed to England's southern extremity to spend two weeks exploring this addictive archipelago. Read all about my trip at The Online Travel Journal: Staying on the Smallest Scilly Isle or see a copy of my article for The Argus Newspaper: Islands of Adventure. 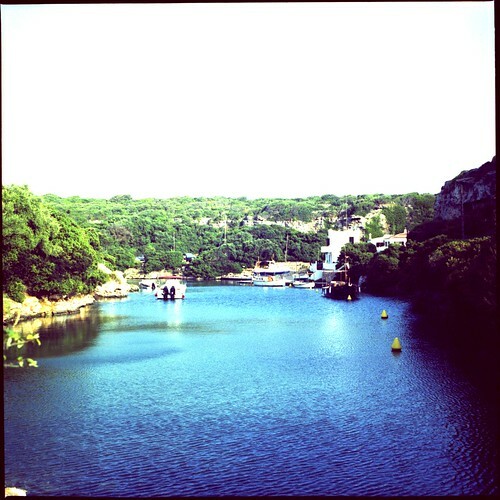 My annual pilgrimage to Menorca was better than ever. I kayaked around the coast, explored the hidden beaches and spent plenty of time on the Cami de Cavals, seeing how it had developed wince my 2011 article for The Independent. I spent a lovely long weekend with my family in a relatively unvisited pocket of Northamptonshire: The Nene Valley. Discover more by reading my article for The Argus Newspaper: Life in the Slow Lane. Autumn saw me heading up to North Wales to the mountain-biking mecca of Betws y Coed. Read all about my weekend away in TNT Magazine: Bike to Basics. Windermere's a long way from my home in Brighton but, on commission for The Argus Newspaper, I discovered that nipping up there for a weekend was easier than I'd anticipated. Find out why in my article for The Brighton Argus: Windermere Weekend. The Channel Islands have always been close to my heart. I've been visiting Jersey since my best friend moved there when I was 15 and, since then, I've made it a habit of hopping across the Channel at least once a year. December gave me an opportunity to share this passion; my article for The Brighton Argus explores the winter appeal of the isles. Real my article, Escape to the Coast. In Feb, I skied down my first Scottish ski slope in Glencoe. Working with Visit Scotland, I spent a long weekend at the Ballachulish Hotel (a former hunting lodge right by a loch) and enjoyed fresh powder and blue skies at Glencoe Mountain Resort. Read all about my weekend away and find out more about skiing in Scotland by reading my blogs for Exploco and Adventure Sports Travel. You can also look out for my Glencoe article in The Brighton Argus. Next on the list was County Durham. On commission with The Independent and working with This is Durham, I whizzed back up north with my mountain-bike to spend a weekend on the trails and single-tracks in Hamsterley Forest. My bed for the night was Headlam Hall -- the sort of place that can be relied on to do everything that little bit better; from the umbrellas by the doorways and the heavenly spa rooms, to the locally sourced sausages at breakfast and the outstanding views. I'll be back. Read about my weekend in County Durham in my article for The Independent: Blazing Trails in the Dales. For me, no winter is truly complete without a trip to the Alps. This year I spend ten days in Les Contamines - a beautiful little resort, not far from Chamonix. Superb ski-touring, outstanding powder, uber-friendly locals and a lack of British seasonaires made this one of my best ski trips to date. Watch this space for upcoming articles and blogs, or contact me for content. This weekend, I'm off to Centre Parcs for the first time in 15 years. I've got a twilight spa already booked and am planning a healthy weekend of woodland walks, plunge-pool action and racket sports. I'll be back to blog and let you know how I hold out! The first week of April will see me jetting off to South Africa for 11 days in the Western Cape. Cage diving with sharks, abseiling off Table Mountain, mountain-biking in the winelands and touring the vineyards are all on the agenda so far. I'm accepting commissions for this trip at the moment, so feel free to get in touch. 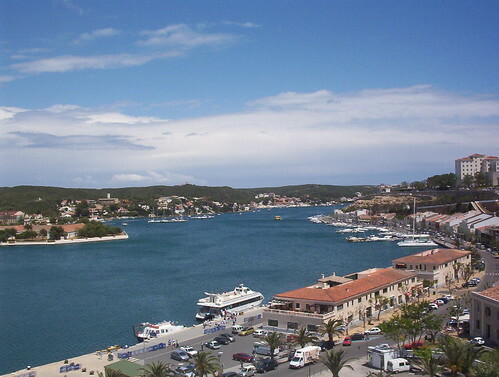 It'll be back to Menorca for my umpteenth summer in August. This year's trip will be wildlife and bird-watching themed. I'll be taking my collapsible kayak along too, as well as my walking boots, fishing rod and running shoes. If you'd like a Menorca expert to write for your publication or website, drop me an email or give me a call to chat more. "Three, two, one, let's monoski!" 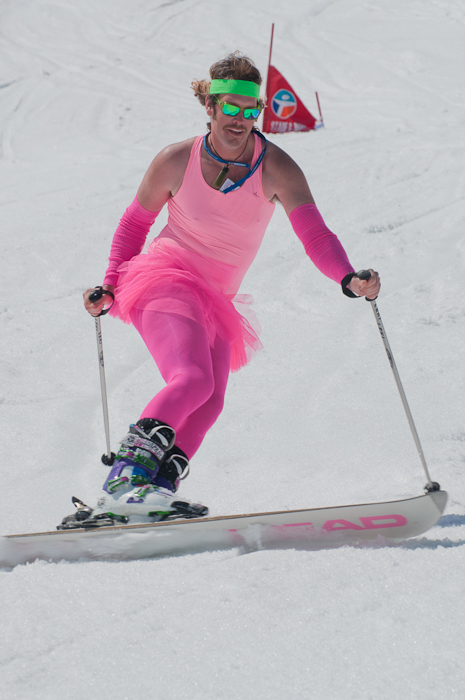 boomed a voice on the tannoy, and the first two competitors shuffled across the start line and raced through the eight gate giant slalom course, in a blur of banana yellow and flamingo pink. 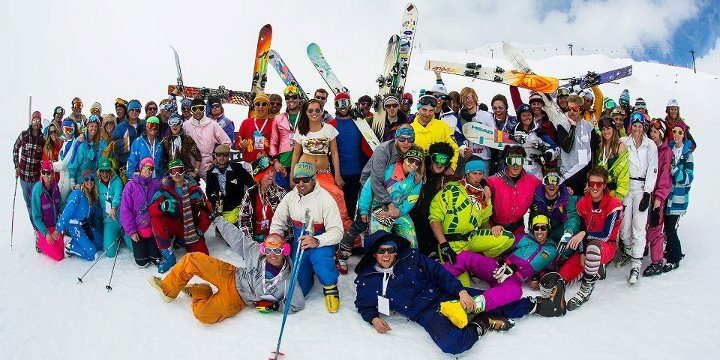 Last April, I was in Val d'Isere at the World Monoski Championships - an event which started off as a few friends having a laugh with some old skool ski gear but, six years later, has become one of the hottest events in Espace Killy. Whilst entry into the competition isn't essential, fancy dress is. 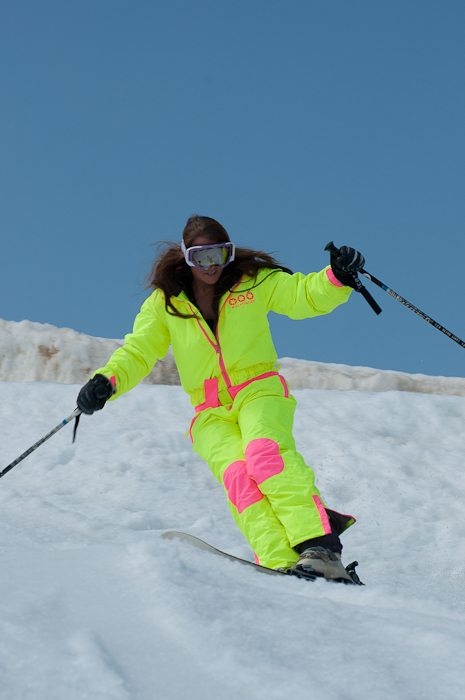 Don't even think about turning up unless you're sporting a day-glo one piece suit, fresh from the 1970s, a fluorescent head band or, at the very least, a pair of mirrored sunglasses. Most competitors have never set feet on a monoski before, so there's no need to worry about lack of experience. In fact, it's the low skill level which makes the event such good fun: many struggle to make it up to the start line in the first place, usually catching an edge and getting dragged the rest of the way up the slope with the Poma still stuck between their thighs. And spectators are well looked after, with steak haches sizzling on the barbeque and soft drinks flowing - bring your own booze if you fancy chilling out with a beer in the spring sunshine. The competition itself is a knock-out event, with pairs of monoskiiers racing each other in turn. 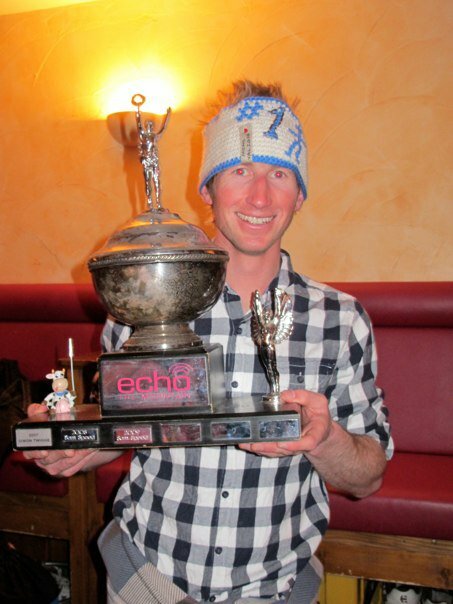 Last season, Simon Twigge of the Tignes Chalet Company, won the event for the third time, and Amanda Pirie took the trophy for the women. 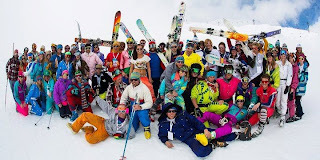 The awards ceremony and after party is hosted at Blue Note Bar, and the celebrations tend to go well into the night, with fete-style drinking games at various pubs and bars in Val d'Isere. Read my full article about last year's champs in this month's Ski and Board Magazine, or visit themountainecho.co.uk to find out more. This year's champs are on April 17th. To enter, visit Blue Note Bar or Planks Clothing in Val d'Isere to sign up. YSE chalets (yseski.co.uk) offer a week's half board with flights from £535. If organising board and flights separately, snowdroptransfers.com offer good value transfers. THREE hundred kilometres north of Sabah and surrounded by unfathomably clear waters, the island of Layang Layang is hammerhead heaven. Fishing is banned here and the island’s 13 coral reefs create breathtaking underwater scenery that teems with marine life. Expect everything from giant clams, barrel sponges and immense gorgonian fans to peaceful turtles, arrowcrabs and anemones. Spectacular nudibranchs offer endless fascination for macro photographers and huge schools of redtooth triggerfish, pyramid butterflyfish and unicornfish make for superb snorkelling. Layang Layang’s unfathomably clear waters, by U.U.Nudi, Flickr. With the ocean floor dropping away to around 2000 metres at the edge of the reef, the real draw cards are in the deep. Tuna, leopard shark, manta rays and barracuda can be seen in the abyss, and even whale sharks put in an appearance. But it’s the hammerhead sharks that top many divers’ wish lists, as this is one of the few places in the world you can expect to see hundreds of hammerheads. April and May are the best months to see them. Sightings aren’t guaranteed every dive but, at depths of 30-40 metres, if you’re patient enough you can find yourself amongst schools of over 100 sharks, each around three metres in length. Stay for a full week and dive every day to maximise your chances. There are around 20 different dive sites to choose from at Layang Layang, all accessible via a short boat ride from the island. Each site is spectacular in its own right, but some offer more chance of hammerhead sightings than others. Most hammerhead dives start at ‘The Point’. Here, divers swim away from the reef and descend into the blue to about 30-35 metres, before ascending slowly back up the reef wall. ‘D’Wall’ is another top spot. Here, the sheer wall is adorned with crustaceans, sea fans and soft corals. Schools of surgeons and jacks teem around the reef, with white and grey tipped sharks and manta rays common visitors, alongside schools of hammerheads which can be seen cruising in the abyss. Hanging out with hammerheads, by bocagrandelasvegas, Flickr. ‘Dogtooth Lair’ is famous for its barracuda, jacks, butterflyfish and, of course, dogtooth tuna. But these can quickly become overshadowed when the hammerheads come into view. ‘Gorgonian Forest’ is a particularly beautiful dive site, where hammerheads can be seen soaring above the barrel sponges, gorgonian fans and giant clams. ‘Wrasse Strip’ is renowned for its intricate and techicolour corals. Hammer-heads have been known to arrive in their hundreds and the small caverns here are home to batfish, sweet lips, soldier fish and trigger fish. But Laying Layang isn’t all about hammerheads, and if you’re not lucky enough to bump into a school whilst you’re out there, your log book will still be bursting with spectacular sightings and dramatic dive sites, which have earned the island its nickname, “Jewel of the Borneo Banks”. ‘Sharks’ Cave’ is a tranquil cavern where leopard sharks rest amongst the sea fans; ‘The Valley’ is a magnet for groupers, sweet-lips, surgeon fish and fusiliers, as well as flat-worms, nudibranchs and crustations. With its abundance of small tropical reef fish, ‘Wreck Point’ is a good option for snorkelers, and divers can descend over the edge to find manta rays, dogtooth tuna and reef sharks. This is also a good spot for night diving, where huge bumphead parrot fish can be found sleeping in the shallow drop-off. To get to Layang Layang take the hour-long chartered flight from Kota Kinabalu in Sabah. There’s only one resort on the island, which stays open for just four months of the year, with the monsoon season putting it off limits for the remainder. Layang Layang is also known as ‘Jewel of the Borneo Banks’, by U.U. Nudi, Flickr. As an isolated island, with no decompression chamber, safety is paramount and so dive rules are tight. Don’t expect to go boozing at lunchtime and then head back into the water – it’s not allowed. There’s a no gloves policy, maximum depths are set at 40 metres and no decompression time is allowed. There’s no Nitrox gas available and so technical dives are off the menu. A breeding ground for thousands of sea swallows, avid bird-watchers could also enjoy a few days here, with black-napped terns, Pacific golden plovers and Plumed egrets amongst the highlights. Taman Negara Nationa Park. Pic: HooLengSiong, Flickr. From high-altitude mountain tops to underground caves, virgin rainforests to alpine ecosystems, and freshwater swamps to salty shorelines; Malaysia’s National Parks make up an area comparable in size to the United Kingdom and stretch from Sabah and Sarawak, on Borneo, to Peninsula Malaysia. Most reserves offer a range of trails suitable for anyone from the occasional walker through to pioneering explorers. The 4343 sq km Taman Negara, on Peninsula Malaysia, is the world’s oldest tropical rainforest. It has been protected since 1938 and forms the country’s largest conservation area. The flora and fauna here has evolved over millions of years and can be experienced via day-long treks, extended expeditions, night safaris or canopy-level walkways. Ambitious trekkers can tackle the 4-7 day ascent of Gunung Tahan (2,187 m) - the highest mountain in Peninsular Malaysia. Endau-Rompin National Park is the second largest in Peninsular Malaysia. The 900 sq km park nurtures a host of rare species such as Peninsula Malaysia’s largest population of Sumatran rhinoceros and native Malay tribes like theOrang Asli people. It also features outstanding natural landscapes. A trekking highlight is the route to the three waterfalls, Pandan, Beringin and Tinggi – a cascade over volcanic rock formations dating back 200 million years. Sumatran Rhino - Endau-Rompin National Park. Pic: Just chaos, Flickr. At just 10 sq miles, Penang National Park is Malaysia’s smallest – you could explore it in one day. Highlights include nesting beaches for endangered turtles, shorelines patrolled by macaque monkeys and one of the few mixed saltwater and freshwater lakes in the world. Take your pick from three different marked trails, or explore the park via the canopy walkway. Batang Ai National Park, in Sarawak, links with Lanjak-Entimau Wildlife Sanctuary (Malaysia) and the Bentuang-Karimun National Park (Indonesia) to form 10,000 sq km of protected rainforest. The park boasts Borneon gibbons, hornbills, giant squirrels, the clouded leopard, Malaysian honeyguide and the densest concentration of orang-utans in central Borneo. Experience the diversity via the five marked trails; visitors must be accompanied by a registered guide. Niah National Park, in Sarawak, harbours 31 sq km of dense forest and is considered one of the world’s most important archaeological reserves. Thought to be one of the birthplaces of civilisation, the oldest human remains in Southeast Asia were found here in 1958 at the Niah caves. Watched over by the summit of Gunung Subis (394m) this small reserve draws archaeologists, ecologists and tourists from across the globe, and is marked with a network of trails. Gunung Mulu National Park in Sarawak has also been a UNESCO World Heritage site since 2000. Best known for its spectacular limestone karsts, Mulu is characterised by its network of underground caves and its razor-sharp rock formations, known as ‘The Pinnacles’. Home to some of the largest caves in the world, it’s thought that around 70 per cent of these still lie undiscovered. Bako National Park, is Sarawak’s oldest park. Located near Kuching, Bako stretches along the coastline for around 27 sq km featuring plunging cliffs, white sandy beaches and craggy headlands. Seventeen colour-coded trails offer a range of challenges. A guide is invaluable for pointing out the mouse dear, bearded pigs, proboscis monkeys and other wildlife. Kinabalu National Park in Sabah was designated a UNESCO World Heritage site in 2000, and over its 754 sq km boasts every type of plant-life, from eucalyptus to oak. It is also crowned by Mount Kinabalu (4,095m) – Malaysia’s tallest mountain. The astounding diversity of flora and fauna, spectacular scenery and irresistible summits here draw in excess of 400,000 visitors each year. tallest mountain in Malaysia – Mount Kinabalu. Pic: Chang'r, Flickr. Juggling expeditioning, travel and teaching, I specialise in writing about outdoors/adventure travel and reviewing the kit I've used on my trips.